Beaducation: The Blog: The Kits Have It! Why do folks love a kit? I guess its because it includes everything you need with no fuss AND you typically save a little money by purchasing the products all together. That is certainly the feedback we have gotten with our Stamping on Metal Starter Kit. Did you know that Our Starter Kit is our single best-selling product year after year? 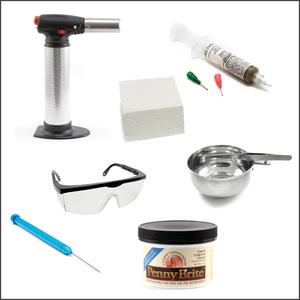 We sold more than 650 Stamping Starter Kits in 2012 alone! Nothing makes us happier than these kits flying out the door because it means we have more people discovering the fun and versatility of stamping! This week our Inventory Team reorganized their work area just so they could make room for more kits! Colin hauled 40-pound shelving units and built new receiving tables just to create more space for counting those copper blanks, packaging those letter sets, bubblelope-ing those hole punch pliers and getting them set to fly off to Tulsa, Port Huron, Omaha and even Perth, Australia. Soldering has always been a jewelry fundamental, and with new books like Kate Richbourg's Simple Soldering soaring to the top of the craft book charts and Joe Silvera's Soldering Made Simple being a staple in a budding jeweler's library, we knew we had to create our own Soldering Starter Kit. Just as we suspected, this kit has been very popular since we launched it last September. Stampers are now starting to add Solderable Accents to their stamped pendants and we love it! Maybe we should add a few more kits! What about a riveting one? 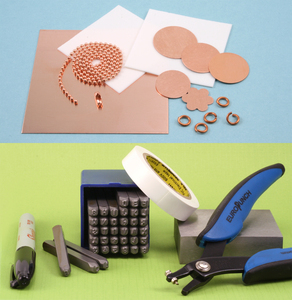 I heard through the grapevine that we may see some Design Stamp Collections to accompany the Stamping Starter Kit and allow new stampers to add Collage Stamping to their repertoire of jewelry skills. Stay tuned for more in our Kits and Collections section!